24 hours in a day isn't enough time for Cheryl. Yet, the 38-year-old transformed her body from pregant with twins to top-tier figure material in two years. Beat that! I always said I would compete after I had kids and appear in my favorite magazine—Oxygen. I was in my mid-30s and my bucket list was growing with few items getting crossed off. When the twins were born almost three years ago, I really had no excuse left, and a fire was lit within me. I remember looking in the mirror and not loving what my stomach, arms, and legs were showing me. "You just had two babies!" was not a good enough reason for me to postpone the vision I had for my body. My husband and kids have all benefited from my healthy lifestyle as they have a wife and mommy who is energetic, happy, and best of all, a great fitness role model for them. In December 2009, the twins were three weeks old. I announced to my family and friends that I had a goal— I called it "nine months in the belly, nine months out of the belly." With the help of Julie Bonnett at Contestprep, I was able to drop the weight, shed the fat, tone the muscles, and do my first post-baby photo shoot! Setting a time-specific achievable goal allowed me to focus. I had a plan. This required doing cardio whenever the babies were sleeping. If that meant three 20-minute treadmill sessions a day, or an 11 p.m. stationary bike ride, I was committed. I made sure I always had great shows pay-per-viewed, magazines, new music on my iPod, and most of all, fuel for my body with proper nutrition throughout the day. Quitting was never an option. I wanted to inspire other moms and show them that having kids doesn't mean your own fitness goals disappear. Sure, there were long nights awake with the babies, long days juggling three kids, a husband, home, and a part-time job. When things got overwhelming, I took an extra rest day and refocused my thoughts. For inspiration, I looked within—posting a picture of my favorite fitness model was a start, but not realistic. 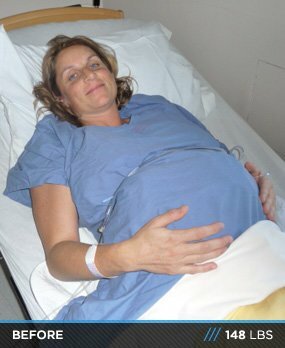 I had to inspire myself, so I kept a picture of me the day I entered the hospital to deliver the twins on my fridge. Every time I opened the fridge to eat I imagined what could become of this body. After the photo shoot, I decided to set another time-specific goal—the stage. My first competition in March of 2011 was an amazing experience. Who knew there was so much involved for one day onstage? I continued training hard, eating clean—with a nice cheat meal once a week—and placed second in June 2012 at the Manitoba Provincials in Figure Medium. You know it's a lifestyle when your oldest gives you a spoon of ice cream and says, "Try it mom, you're on off-season. It's OK."
The best way to shed pounds and build muscle is by consistently eating a small variety of clean foods. When I removed all the options I was giving myself daily, I started seeing serious results. I now see my relationship with food as simply a source of fuel. Dinners out with friends are about conversation and overall experience rather then how much food we can stuff into our mouth. To lose the baby weight, I did four days of weight training (light weights, higher reps) and five days of cardio per week. When I decided to compete in figure, I switched to a five-day weight, six-day cardio split. Since June 2011, I've trained with Jen Spiss at Revive Fitness and Paul Dyck at Creative Conditioning in Winnipeg. They're amazing athletes and hugely supportive of my goals. Being accountable to my trainers is key for me to stay on track for competitive goals. I let them decide what program works best for my body. I don't argue and I certainly don't whine. As the saying goes, "Life begins outside your comfort zone." I'm currently prepping for a show, so my current training is three days on, one day off, two days on, one day off. What challenged me most was the constant balancing act. 24 hours in a day isn't enough. I quickly realized that food prep is 90 percent of my success. If it's cooked, portioned out, and ready for me to grab and go, I'm rarely hungry. I work with my husband to schedule in my workouts and found the best time for me to train is when the kids are asleep. This means 5:30 a.m. for weights and 8:30 p.m. for cardio. The key is to figure out what works for you, but always put yourself high on your list of to-do's each day. I'm contemplating a WBFF show in early 2013 and will also hit the Provincial stage in June 2013 to try and win the figure medium class. I took second in 2012. Don't wait until Monday; start now. Find a trainer, a nutrition coach, and spend money on yourself. You are worth it. Tell everyone what you're doing and be accountable to anyone who will listen. Keep pushing. The feeling of accomplishment far outweighs any chocolate I have ever consumed. When it seems overwhelming, take an extra rest day. Chances are you will rejuvenate and come back more focused then ever. I'm always looking on Bodybulding.com for new exercises, articles relating to competing, inspiring stories, and I never hesitate to buy protein powder or other supplements from the Store. Bodybuilding.com has great shipping prices to Canada and I can get unique flavors that are not available to us Canadians. Sometimes a new flavor of protein is enough to push through to your end goal.